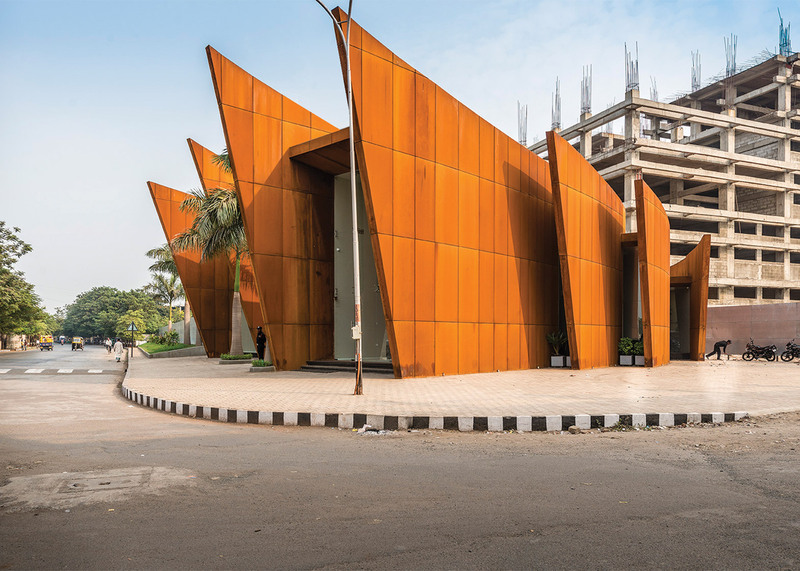 Overlapping angled fins clad in pre-rusted steel extend from the front of this crescent-shaped office building in Surat, India, by Mumbai architect Sanjay Puri (+ slideshow). 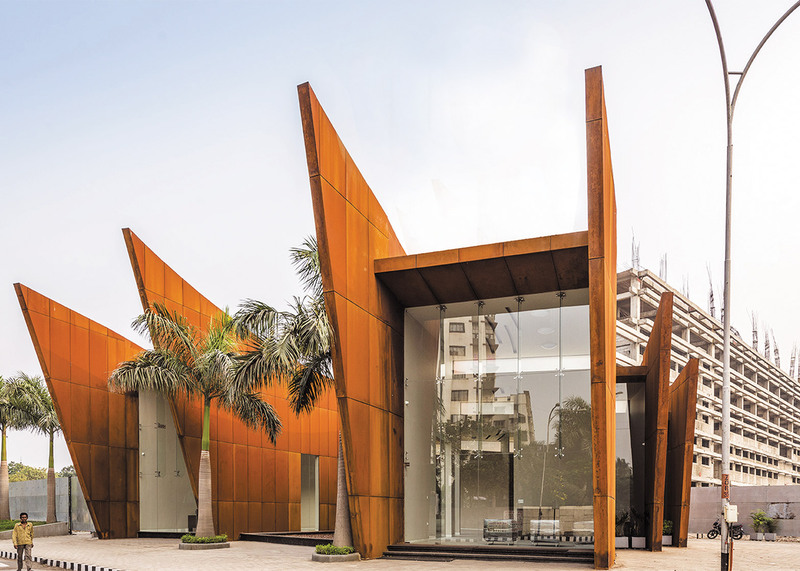 The Crescent was designed by Sanjay Puri Architects to house the offices of a local property developer. Situated on a small plot at the intersection of two roads, the building is conveniently located for the developer's clients and is intended to function as a promotional landmark. 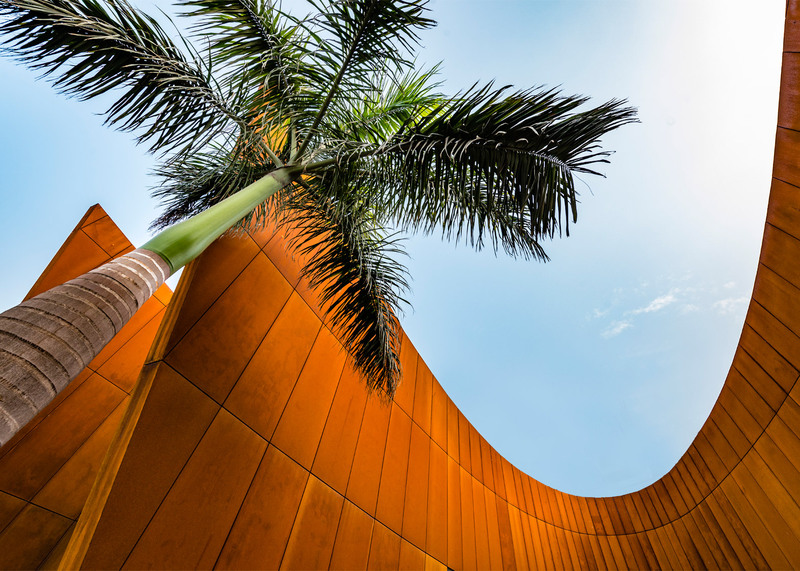 Each fin is clad with weathering steel – the pre-rusted metal often known by the brand name Corten – giving the building a distinct orange colour. 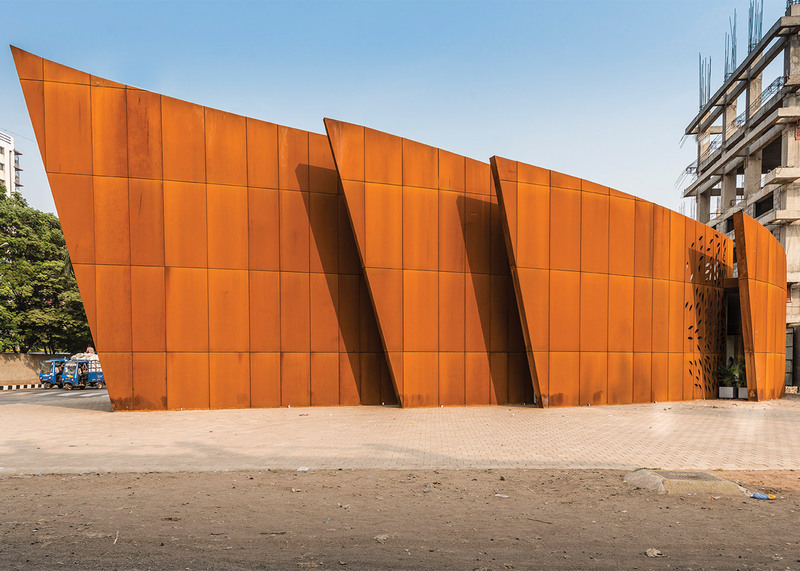 According to the architect, the cladding material was chosen because of its "beautiful naturally aged look, which adds to the sculptural built form of this small building." The angular form is a direct response to the intense sun, which results in extreme temperatures for much of the year. The curving wall forms a protective shield against the southern sun and opens out to accommodate a series of layered north-facing windows. "The layers are based upon the internal spaces, deriving light from the northern side to create cooler internal spaces," Puri told Dezeen. "The walls are angled and projected to minimise the east and west sun and reduce heat gain." Visitors and staff enter a reception area at one end of the crescent, which is separated into portions containing offices, a director's room, a kitchen and a dining area. At the centre of the building is a small pond, surrounded by glazed walls that provide views out from the circulation area that wraps around it. "While the office spaces are small in response to the clients brief, the open courtyard around which the main circulation moves allows the internal volumes to be perceived as larger, and simultaneously opens the internal spaces to the exterior," Puri added. 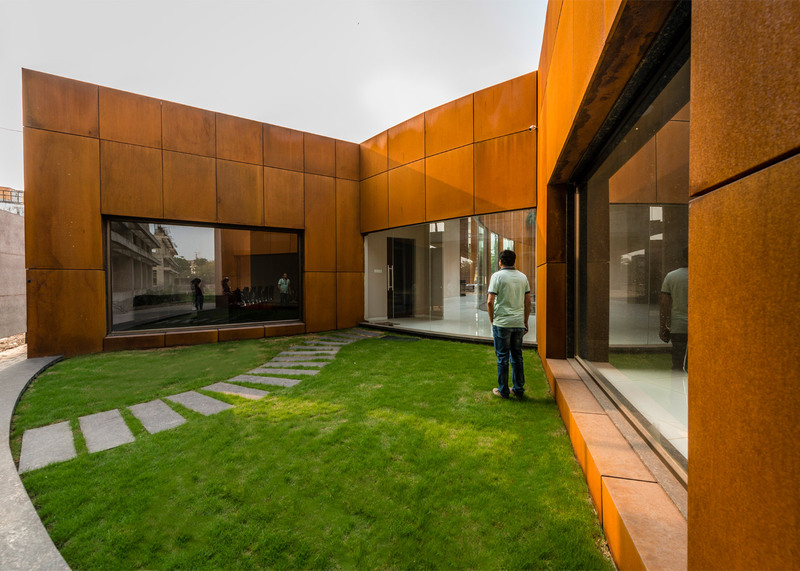 The director's office and dining space are positioned on either side of a turfed courtyard that slices into the curving rear facade. This south-facing outdoor space is protected by the building's high walls and can be accessed from the central corridor. A steel framework supports the structure. Its simple construction enabled its assembly in just three months. 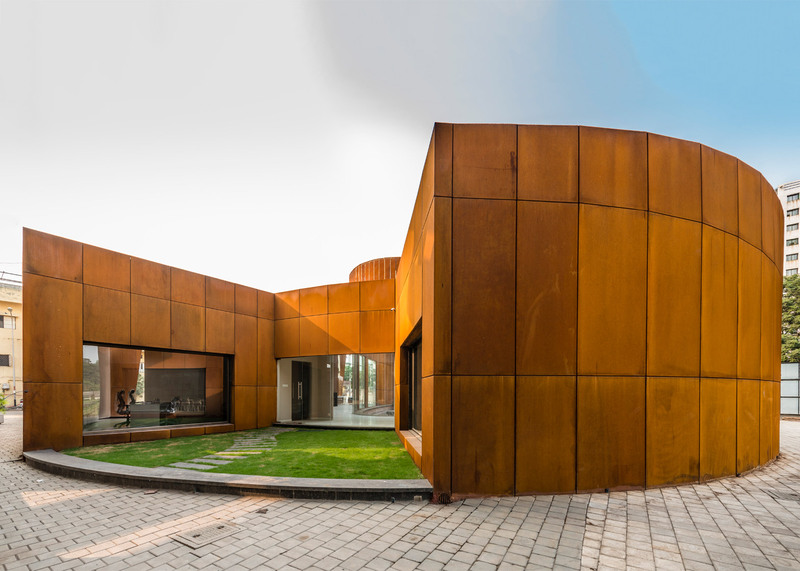 Weathering steel has also been used recently to clad a wedge-shaped Holocaust museum in a Polish village, and a church near Madrid featuring windows that extend out in several directions from one of its facades. Photography is by Vinesh Gandhi.